I was able to complete the painting with literally no time to spare! My entry is being dropped off today and then it’s a waiting game until February when artists are to be notified. Either way I’m excited as now I have a compelling piece to add to my portfolio. I plan on creating a few more pieces that play with the relationship of Light and Dark. 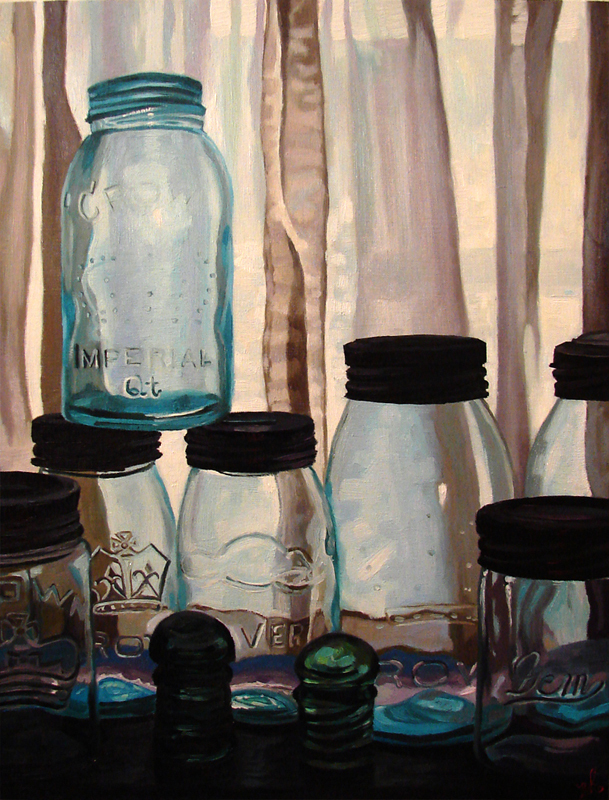 I continued on with Step Eight by painting in the rest of the jars. Adding highlights and shadows where needed, etc… Here is my final image of the painting. The final image of the painting Cool and Collected. The colours are a little off on the screen. They are actually more intense in person. Final thoughts: I really enjoyed painting this piece. I think it was the combination of painting on wood panel and with challenging myself to explore the relationship between light and dark. I also had the challenge of switching up the warm/cool aspects of the piece. All in all I think this was an important exercise for an artist to challenge themselves with. I look forward to more challenges like this by creating a few more paintings that explore this light/dark relationship. Upcoming…I have four more Juried Exhibitions that I plan on entering and two more non-juried shows. The next piece that I plan on completing is for this upcoming Tuesday! I hope the paint is able to dry before I have to drop it off…if not I will just have to forfeit that piece and just submit one (that is dry!). My next Process Series will be of this particular painting. Having said that I’m off to paint!